Disc 1: Series overview, counseling, complete Bible lesson Jesus: My Savior and Friend and Hudson Taylor missionary story. 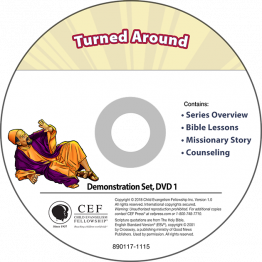 Disc 1: Series overview, counseling, complete Bible lessons and Mary Slessor missionary story demonstrations. Disc 2: Full demonstrations of all songs suggested in the series: Have You Heard?, His Name Is Jesus, Let Me Listen, John 3:16 (For God So Loved the World), Luke 19:10 (For the Son of Man), John 11:25 (Yet Shall He Live). Disc 1: Series overview, counseling, complete Bible lessons, Gospel Spotlight and Wonder Time demonstrations. Disc 2: Full demonstrations of all songs suggested in the series: God's Power, God Wants to Spend Time with Just You, Jesus Is the Good News, Three Questions, Trinity Song, What's the News?, Psalm 19:1 (The Heavens Declare), 2 Timothy 3:16-17 (All Scripture). Disc 1: Overviews, Counseling, complete Bible lessons and I Dare (Amy Carmichael) missionary story demonstrations. Disc 2: Full demonstrations of all songs suggested in the series: One Way, 7 MIT Song, Jesus Loves Me/Amazing Grace, Stop/Go, Jeremiah 31:31 (Everlasting Love), John 14:6 (I Am the Way), Hebrews 11:6 (Without Faith). Disc 1: Series overview, counseling, Bible lesson and Ringu missionary story demonstrations. Disc 2: Full demonstrations of all songs suggested in the series: Children of God, Just Turn Around, Let Me Listen, Let's Get Started, Ephesians 2:8-9 (By Grace), Luke 19:10 (For the Son of Man), Romans 5:8 (God Shows His Love for Us).